Social Awareness activities are an interactive platform for the students to be aware of their responsibilities towards society. At subodh we encourage such initiatives & are earnestly involved is fruition of our social concerns. 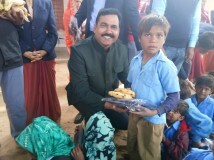 As a part of the social responsibilities of institution a new initiative was taken this year by the college. 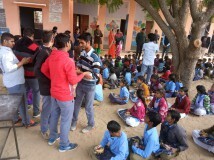 The college adopted a Government School, Saligrampura where the faculty members and students often go and distribute food items and woolen clothes and spend time with them. We try to understand and resolve their basic problems related to their studies and needs. Our students participate in this with great zeal. 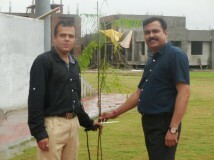 The tradition of Plantation in surroundings has been adopted by the institution. At subodh every extra- curricular activity is concluded with the conduction mof a plantation programme, leading to a green and clean environment. In this context a Brief guest lecture with workshop by the President of SASS (Samajik Anveshan Shodh Sansthan) was kept in the college. 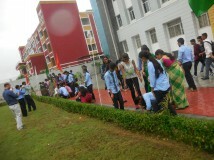 The students learned the methodology to grow and maintain a plant using water conservation. A MoU was signed between S.S. Jain Subodh College of Global Excellence and SASS. The bold and the enthusiastic team of Nukkad of college students played very important role in spreading message on social issues like, Women Empowerment, Beti Bachao, Corruption etc throughout the session at various places of the city. God resides in cleanliness and every initiative should begin with self. Following this idea a grand scale one day Swachchta Abhyaan was being run in the college premise by the students as well as by the faculty members. This was the event of self-learning, working with team spirit and awareness to Reap & maintain neat and clean environment. Our Students also participated with great zeal in the social awareness program “Bikeothon-16” a Bike Marathon, organized by RAYS & Fortis on the occasion of World AIDS DAY December 1, 2016 to spread the message of AIDS Awareness Programme in the city. The college students and faculty members actively participated in blood donation camp run by Red Cross Society Jaipur.